John 3:3 is one of the verses used by Calvinists to defend the idea that regeneration precedes faith. According to Calvinists, when Jesus says that “unless one is born again, he cannot see the kingdom of God,” this means that unbelievers are spiritually blind, and cannot even see the offer of the kingdom of God, or see their need for grace and everything else that comes with the kingdom of God, unless and until they are born again. In other words, according to Calvinists, one must be born again before he or she can see anything related to the kingdom of God, including the gospel, the forgiveness of sins, and God’s offer of eternal life through faith in Jesus Christ. What Did Jesus Mean in John 3:3? From the statement of Jesus in John 3:3 about people not being able to see the kingdom of God, it would be difficult to know what Jesus meant. Certainly, as Calvinists claim, He could mean that people cannot even observe their need of grace and forgiveness, or see anything at all related to spiritual matters. The Greek word for “see” (Gk., eidon) can refer to seeing, perceiving, or understanding something. Yet this is not the only way this Greek word can be understood. It can also refer to experiencing something (1 Pet 3:10; Luke 2:26; Heb 11:5), or of visiting a place or person (Luke 8:20; Acts 16:40, 1 Cor 16:7) (BAGD, 220-221). With these various interpretations, how can we know what Jesus meant when He said that unless one is born again, he cannot see the kingdom of God? By looking in the context. John 3:3 is found near the beginning of a conversation Jesus has with Jewish religious leader named Nicodemus about how to be born again. After Jesus makes the statement in John 3:3 about being born again, Nicodemus gets confused, and asks Jesus to clarify (John 3:4). So in John 3:5, Jesus rephrases His statement. He tells Nicodemus that there are two births, the first birth is physical, and consists of being born of water, that is, from a mother’s womb. The second birth is spiritual, which requires being born of the Spirit. We have physical life from our mother by being born of water, but we also need spiritual life by being born of the Spirit. But Jesus does not stop with clarifying what it means to be born again. He also clarifies His statement about seeing the kingdom of God. Following this clarifying statement about being born again, Jesus says that unless one is born again, they cannot “enter the kingdom of God.” In this way, Jesus clarifies exactly what He meant earlier when He spoke of seeing the kingdom. Jesus meant that only those who are born again may enter the kingdom. 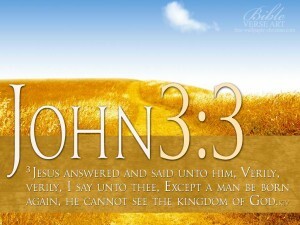 In other words, John 3:3 is not a verse at all about humanity’s total inability to understand, comprehend, or even see anything related to the kingdom of God, but is rather a statement about humanity’s inability to enter into or experience the rule and reign of God in the life (which is what the kingdom of God is) unless they have first been born again (BAGD, 221). John 3:3 is not a verse which defends the Calvinistic teaching that regeneration precedes faith, but is rather a verse which teaches the biblical idea that regeneration precedes life in the kingdom of God. To enter into the kingdom of God, we must first be born of God. To experience the life of joy, fulfillment, satisfaction, and purpose that God wants for us, we must first be born of the Spirit so that God’s new life dwells within us. Jesus goes on to explain this very clearly to Nicodemus in John 3:15-18. Jesus does not say that unless a man is born again, he cannot believe in Jesus for eternal life (Vance, The Other Side of Calvinism, 225). He says that unless a man is born again, he cannot “see the kingdom of God,” that is, he cannot enter into and experience the rule and reign of God in his life. So there is nothing in John 3:3 about mankind’s inability to see or comprehend anything about the gospel or the kingdom of God unless they are first regenerated by God. To the contrary, as seen by Jesus’ own example with Nicodemus in this very text, the call of the gospel and the offer of life with God in His kingdom is one of the primary ways by which we can point unregenerate people to Jesus so that they might believe in Him and find life. It is because people can understand the hope, grace, love, and mercy found the gospel of Jesus Christ that so many people find the gospel compelling. It is because the biblical teaching about the kingdom of God promises joy, contentment, and significance to those who live under the rule and reign of God that the invitation to enter into the kingdom by faith in Jesus Christ has such persuasive power. When the gospel, the kingdom of God, and the offer of eternal life are rightly proclaimed, they have great drawing power to all who are unregenerate, for they contain the light and life that people have been searching for, but not finding. The institutional church has succeeded in spiritualizing the ‘born again’ concept way beyond its original meaning. Jesus was simply showing Nicodemus (a foremost teacher of the Jews) that physical descent from Abraham could no longer be regarded as the precondition to see or enter the kingdom of God (as the Jews did). True faith (therefore ‘begotten/born again by the Spirit) irrespective of bloodline became the precondition and all humanity would have this freedom to choose. ‘Born again’ was understood in the ancient Aramaic and later Hebrew culture to become like a baby again – no traditions or previous knowledge to hinder you. You said in the article about total inability that : “It is because people can understand the hope, grace, love, and mercy found the gospel of Jesus Christ that so many people find the gospel compelling.” I would like to present to you for your consideration the following verse in 1 Corinthians 2 verse 14: “The natural person does not accept the things of the Spirit of God, for they are folly to him, and he is not able to understand them because they are spiritually discerned”. I would present that the spiritual discernment necessary here is from God, therefore, there is total inability apart from God. Great point. 1 Corinthians 2:14 suffers from much misunderstanding because of that phrase “natural person.” It literally read “soulish” or “soulical” person, which is a common theme in 1 Corinthians. It does not necessarily refer to the unregenerate, but to the person who is operating solely (pun intended) through their flesh. In other words, Paul is saying that spiritual truths are spiritually discerned, but if someone’s soul is operating through their flesh, they cannot comprehend the spiritual. Good illustration of the concept of the human’s free will too! Thanks Jeremy! Am learning so much from your posts. How do you think one can be born again? I believe it’s not by saying the sinner’s prayer. What are your thoughts on how to be born again? I agree. The Bible nowhere says to pray the sinner’s prayer. Jesus says that we receive eternal life by believing in Him for it (John 3:16; 5:24; 6:47; etc.). This exact same concept can be found in the letters of Paul and John as well.